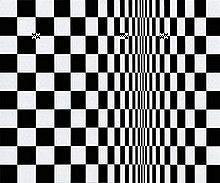 Op art, also known as optical art, is a genre of visual art, especially painting, that makes use of optical illusions. Op art is also known as geometric abstraction and hard-edge abstraction, although the preferred term for it is perceptual abstraction. "Optical Art is a method of painting concerning the interaction between illusion and picture plane, between understanding and seeing." Op art works are abstract, with many of the better known pieces made in only black and white. When the viewer looks at them, the impression is given of movement, hidden images, flashing and vibration, patterns, or alternatively, of swelling or warping.